Today I've grabbed you a selection from Gary Poole's Bookies Enemy No 1 service. Gary is an ace at spotting the value in the early markets and locking in value for himself and his members. This selection was given out last night when it was generally available at 13/2, since then the bookies have woken up to the chances of this one and shortened it in to 11/2 where it still represents a bit of value. Gary is a race watcher, an activity that requires great skill and a lot of time and that's what he dedicates his life to. He is also a player of multiple bets and has bagged some huge profit days with his Trixies, Trebles and Doubles. In fact he has a Trixie on his service today with this selection and two others priced at 8/1 and 9/1. If this one comes off it will win £900 for every pound staked. Ran an eye-catching race here two starts back in a better race than this on his first start since June and a repeat of that effort here should see him go very close.He has since had an outing over hurdles which will insure he's primed since that October run and although he's only run 2 of his 34 races he is still relatively unexposed on the all-weather and last run over C&D suggested there is plenty more to come. Today I want to remind you about probably the best weekly free tip service available on line. These guys give out just one or two bets each Friday afternoon for Saturdays racing. 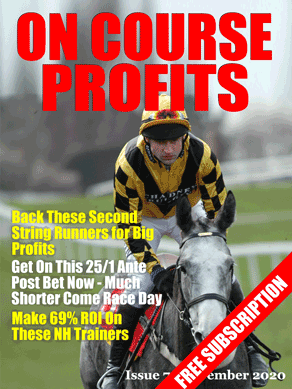 The selections come from top flight tipsters and they make huge profits. So far this year they have given 45 selections and the profit they have made is 60.29 points. A whopping 134% return on investment. If you just stake £10 per selection that is a profit of £602.90 from just one or two bets per week and it's all for free. I am of course talking about the Betting School free tips that come from contributors and tipsters associated with the Betting School Insiders Club. If you are not on this mailing list you are missing out.